Located in southeastern Turkey, Gaziantep is a hub that draws the attention of foodies, history lovers and those looking for a rich melting pot of diverse cultures. Originally just known as Antep, the city's name has an interesting history as well. "Gazi" (veteran) is a prefix that was added onto its name due to its contribution to the War of Independence after World War I. Each city in Turkey is often renowned for one specific specialty; but Gaziantep offers many more than just one. Gaziantep is accepted as the culinary capital of Turkey, and it pledges to totally change the way you eat. One of the highlights includes tasting the mouthwatering baklava that is beyond imagination. Turning into a developing town, Gaziantep – once off the beaten path – is now preferred by many foodies who know where to find the best tastes, and where history lovers look for the traces of past civilizations. "Fıstık" (pistachio) is the first word you must know before you visit Gaziantep since it is a primary ingredient in many of the city's famous dishes, especially its baklava and other desserts. When leaving the city, taking some Antep baklava back with you is also an absolute must. The city offers not only incredible baklava but also history, which lies underneath the city. Indeed, this is what makes Antep the heart of tourism in the region. As soon as you step in this historic city, the atmosphere takes hold of you immediately. As Turkey's city of veterans, Gaziantep has a soul that represents its history and permeates your spirit, which will make you want to stay longer to discover every place, nook and cranny it has to offer. Located on the route of the former Silk Road, the city hides many ancient sites – some of which have yet to be discovered. In places that you can visit, you will feel how the clock turns back to experience many different cultures along with their natural and historic treasures. With its population bordering on 1 million, the city is also where you can witness first-hand why Turkish hospitality is world-renowned as well as experience southeastern Turkish culture. Believe me, Turks are hospitable, helpful and friendly in general, but those in southeastern Turkey see you as visitors sent by God. Gaziantep offers you a different face of Turkey -- one that is slower paced and further removed from a typical Western lifestyle. Now, I want to introduce Gaziantep's must-see list of places to visit, places to experience a southeastern Turkish market and of course, the dishes to sample. The Gaziantep Archaeology Museum is where traces of many civilizations can be found. There are many ceramic pieces dating back to the Neolithic Age, different figures and statues, seals dating back to the Chalcolithic and Bronze Ages and traces from the Urartu, Hittite, Persian, Roman and Byzantium periods – such as jewelry, coins and glass objects – which bear witness to how Gaziantep has been the center of many civilizations throughout history. Zeugma, the biggest mosaic exhibition in the world, may be the most artistic destination in the entire museum. The ancient city of Zeugma in Gaziantep's district of Nizip was founded by Alexander the Great's generals in 300 B.C., and was originally called the Selevkia Euphrates. Accepted as one of the four biggest cities of the Commagene Kingdom, Zeugma was conquered in 64 B.C. and ruled by the Roman Empire, which renamed the city Zeugma – meaning bridge or passageway. Gaining huge wealth and glory in the time of the Romans, the city became one of the region's attractions due to its commercial potential originating from its geo-strategic location along the Silk Road connecting Antioch to China. In 256 A.D., the city was invaded and completely destroyed by the Sassanids; later, a huge earthquake destroyed it once again and buried the city. Due to the invasion and the earthquake, the city and its magnificent structures sadly were unable to be recovered for a long time. In the 1980s, however, the Gaziantep Archaeology Museum conducted the first excavation in the city and found graves and statues. The main excavation that unveiled beautiful mosaics, though, was conducted in 1992. This excavation put Zeugma on the archaeological map and attracted many local and international tourists who wanted to see its glorious mosaics. There are also many villas, an amphitheater, baths and temples waiting beneath the ground to be uncovered. It can be said that the real beauty of Gaziantep is much more than we see above ground. If you are interested in history and ancient civilizations, Zeugma should be at the top of your must-see list when you visit Turkey. Another must is a visit to the Kitchen Museum. It is a very interesting and eye-catching museum where you can learn about Gaziantep and Turkish cuisine, including the foods as well as their ingredients. If you are curious how this mouth-pleasing Antep kitchen came to be, it is one of the best destinations to learn! The Castle Museum is where you can learn about what happened during various wars from the Turkish point of view. It covers the dissolution of the Ottoman Empire, the proceeding occupations and how WW I and the War of Independence left its mark on the city. Bazaars in Gaziantep have a huge place in locals' daily life as well as travelers' visit. The most well known bazaar is Bakırcılar Çarşısı (Coppersmiths' Bazaar) where the traditional culture of Gaziantep is still preserved and protected. The Coppersmiths' Bazaar is the best place in the town for visitors to see with its many traditional copper products and specialties. Touring in the bazaar, you can see smiths maintaining the art of coppersmithing. You can watch them while they making utensils, pots and pans, leaving you amazed by their love of the business and craft, as well as their beautiful products. Also known as the Black Steps Bazaar, Zincirli Bazaar is one of the old-style Ottoman era bazaars built in 1781 by Hüseyin Pasha of Darende. It is where you can find traditional copper pots, utensils and traditional spices and scarves. There are nearly 75 stores and five gates in the bazaar. It was restored by the General Directorate of Foundations in 2009 and is where many sellers offer fruits, vegetables and other foodstuffs and products at wholesale prices. 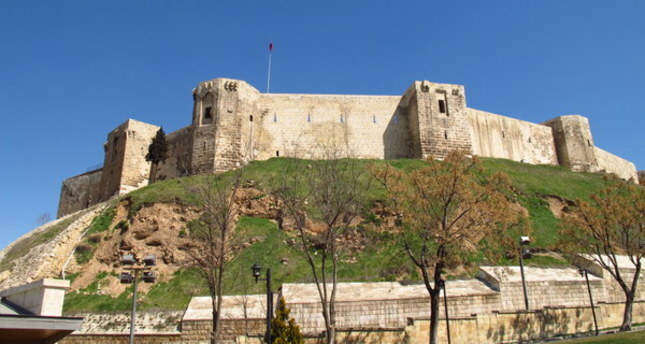 Dating back 9,000 years ago, the Gaziantep Citadel is right in the center of the city. The citadel stands as a symbol displaying the characteristics of the city and gives a majestic and mystically historic beauty to the town. The citadel as it is known today was originally built during the Roman period as an observation tower, but was restored and enhanced to give it its present structure by Byzantine Emperor Justinian I in the sixth century A.D. Being one of the Ottoman Empire's characteristic cuisines, baklava is prepared in large pans, and it is quite entertaining to watch chefs while doing so. Many layers of phyllo dough separated with butter and layers of pistachio are placed in the pan. There are also some versions of baklava made from walnuts and hazelnuts, but the baklava special to Antep is definitely made from pistachio. Eating baklava in Gaziantep is an art; you first need to turn the baklava upside down and touch the base of it to your palate and eat in one go. One of the best Baklavas in Antep is made by İmam Çağdaş, which also has many branches in other cities, and Koçak Baklava. It is not a simple dessert; it is a yummy breakfast and a sweet dream. Katmer features layered "kaymak" (cream) and pistachio, and you must warm it. Locals eat katmer for breakfast, and there are stores in Gaziantep solely serving katmer for breakfast, which are open from 6:00 a.m. until noon. The cream inside the Katmer is often referred to as "kaymağın kaymağı," meaning creme de la creme. As renowned as baklava is, katmer is what will make you truly remorseful if you do not try it while in Gaziantep. It is simply delicious! Kebab is the first dish that comes to mind when someone says Turkey. Many renowned dishes that you taste in Turkey, from eggplant kebabs to shish kebab, actually originate from Gaziantep and southern Turkey. "Patlıcan kebap" (eggplant kebab), "Alinazik kebap" (grilled meat over eggplant puree), "Ciğer kebap" (liver kebab) and "Simit kebap" (thick pistachio puree folded into a mix of ground lamb and bulgur) are among the most mouth-pleasing dishes that will change how you look at kebab culture. There are eight different kinds of soup in Gaziantep, from yogurt soup to tarhana. Lebaniye, Tutmaç, Uyduruk and Muni soups are among the soups that you can taste in Antep. Beyran Soup, made with spices and lamb, is also a breakfast soup that is a must taste. Called "dolma" or "sarma" in Turkish, stuffed vegetables are amongst the Gaziantep dishes that you want to remember the taste of when you leave the city. In Gaziantep, you can taste stuffed eggplant, peppers, tomatoes, zucchini, vine leaves, cabbage, cucumber, onion and potatoes.